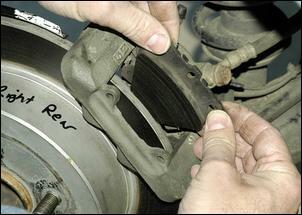 Start talking brake upgrades and it’s easy to also start talking lots of money and complexity. For example, going to bigger discs and calipers could easily involve you buying and fitting larger diameter wheels, a different master cylinder and different brake bias valve. Hmmmm – that’s fine, but only if you’re happy spending a lot! But there’s an easier solution - try upgraded quality discs, pads and fluid. It’s all stuff that you can do at home, you get to keep your original wheels, and it doesn’t need fancy tools or complex procedures. Best of all, all the factory systems like ABS and EBD (electronic brake distribution) will keep working happily and your insurance company shouldn’t turn a hair. And the results? Less fade, more bite and a more progressive pedal. Sounds good to us! 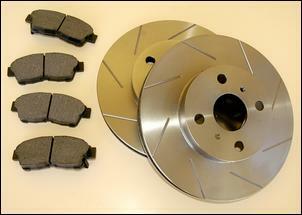 But before even thinking of upgrading brakes, they’s a couple of things you should first consider. Brakes can work only as well as the grip of the tyres on the road allows them to: if the wheels are hopping in the air when braking over bumps (because the shock absorbers – dampers – are stuffed), then a brake upgrade will be worthless. 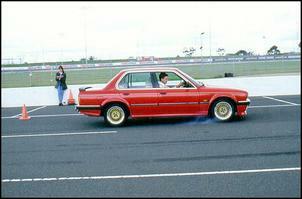 Same with tyres – if the tyres have little grip, you can’t expect a brake upgrade to make a helluva lot of difference. It sounds boring but it makes sense – make sure that the suspension and tyres are up to scratch before bothering to invest in a brake upgrade. 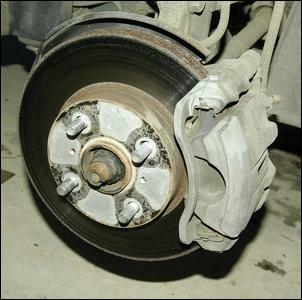 Once you’ve considered the health of the suspension and the quality of the tyres, it’s time to inspect the brakes. Jack up the car and place it on jack-stands, then remove the wheels. On disc systems there are three key areas to look at – how much meat is left on the pads, the condition of the discs, and the general condition of the calipers and hoses. There should be at least 1-3mm of pad material left across the whole face of the pad – in some cases, pad wear is asymmetrical so make sure that you use a torch to inspect as much of the pad as possible. Note that while the texts say 1mm, this should be regarded as the absolute minimum and in many cases, pad replacement should occur prior to this thickness being reached. There are three aspects to look out for when inspecting discs. Firstly, the discs shouldn’t be heavily scored or cracked. That is, the discs surface should be shiny and flat, not badly scratched by the pads. Secondly, the disc shouldn’t be thinner than the minimum recommended thickness. 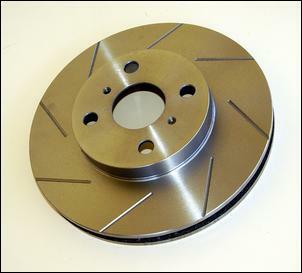 The discs get thinner through two processes – wear, and being periodically machined. If the disc has been machined a few times, and then is worn thinner by the action of the pads, it may be at or below minimum legal thickness. Some discs have their minimum stamped on them while with others you’ll need to consult a brake discs catalog (eg www.dba.com.au) to see what the spec is. 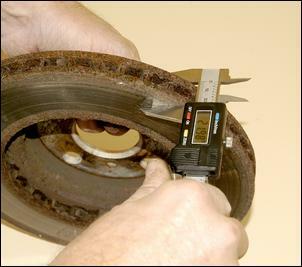 You can easily measure the disc thickness with a measuring caliper. Finally, you should have a look at ‘run-out’, that is, see if the discs are warped. This is most easily checked by turning the hub by hand – if the disc resists being turned at just one part of the rotation because the pads rub at this spot, it may be warped. Here you’re looking mostly for brake fluid leaks, frayed hoses and the like. A braking system should have no leaks at all and the hoses and lines should be in good condition. If you have problems in these areas, we suggest that you take the car to a brake shop to have the calipers overhauled and the hoses replaced. What you decide to do depends quite a lot on what you’ve just found in your inspection. Note that if you’ve discovered that the discs are below minimum thickness, or the pads are at their wear minimum, or the discs are badly scored or have lots of run-out, you have no option – at minimum, maintenance is required. Normally, discs that are scored or have run-out problems are machined, which both smooths the faces and also ‘trues’ them. 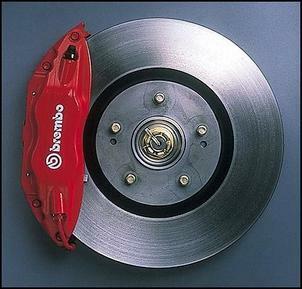 However, another option is to take the opportunity to replace the discs with a higher performance design. Same with the pads, too – if they’re well down in material, you don’t just need to buy stock replacements but instead you can upgrade. That way, the cost of the performance increase is lessened – because you were already going to have to spend maintenance money anyway. Brake work is always done in pairs on the one axle – so you’d have both front discs machined, or replace the front pads, for example. But you don’t need to do all four wheels at the one time – so if you’re on a budget, keep this in mind. Another thing to consider is how common your car is. If it’s a high priced European exotic, for example, it’s quite likely that aftermarket upgrade brake pads won’t be available off the shelf (in Australia, at least!). 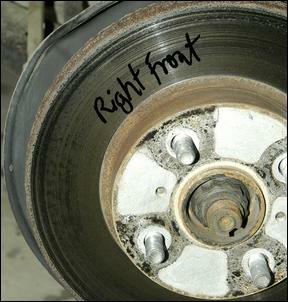 Instead it might take a two or three weeks to get the right pads in – time when you don’t want your car off the road. Another hassle can be with grey market Japanese imports, where the dilemma is in deciding exactly what pads and discs fit the car. (It’s seldom a problem sourcing the components in the end, but it can take some time to work out what actually fits.) This is why inspection, decision-making and ordering should occur before you have the whole brake system in pieces. ...and front pads well down. But the back was a completely different story, because we’d recently upgraded from the original drums to Corolla discs and matching calipers. These were in much better condition, but since the front needed a complete upgrade, why not do the back at the same time? And finally there was the brake fluid. 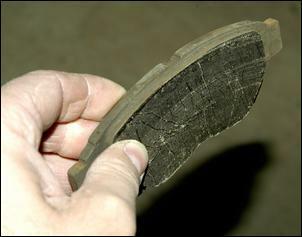 Nearly all brake fluid is hygroscopic - that is, it tends to absorb moisture from the air. The more moisture that it has absorbed, the lower its boiling point. That’s why brake fluid should be replaced every two years or so... and why in the case of this import which came without service records, fluid replacement was a must. So what do we have on the shopping list? New discs front and back, new disc pads front and back, and new brake fluid. The sky’s the limit when it comes to picking replacement brake parts – even those that will fit straight in all the original spots. The discs can be standard (ie a normal replacement), grooved (sometimes called slotted) or drilled (the ones that look like mice have been nibbling holes). Pads can be standard, grading all the way up to full-race. 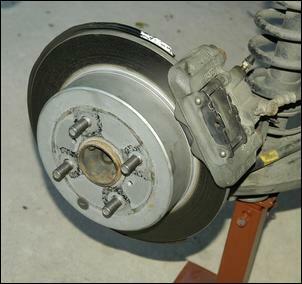 Discs and pads specified as a ‘street level’ or ‘towing’ upgrade will have the least everyday downsides while still providing a noticeable improvement over stock. In the case of the <?xml:namespace prefix = st1 ns = "urn:schemas-microsoft-com:office:smarttags" />Toyota we went for EBC Kevlar ‘black’ pads that cost AUD$79.20 for the fronts and AUD$59.40 for the rears. 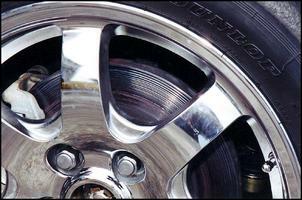 Originally we had intended to use DBA Longlife slotted rotors but they proved not to be available for this car. Instead, we sourced RDA replacement rotors with custom machined slots. These cost AUD$187 a pair (front) and AUD$198 a pair (back). 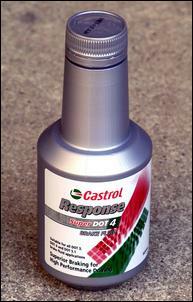 The brake fluid we selected was Castrol Response, a premium fluid. So, that’s all the parts in hand – now, what about fitting them?